NEW! 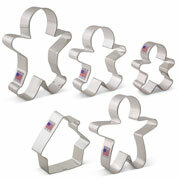 Make your own gingerbread family with this 5 pc cookie cutter set. It's a great alternative to a 3-D gingerbread house, and an activity the whole family will enjoy! 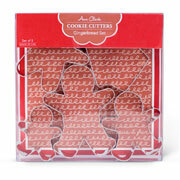 Gingerbread Man: 4 1/2" x 4"
Gingerbread Man- 5" x 3 3/4"
Gingerbread Man- 3 3/4" x 3 3/8"
Gingerbread House- 3 1/4" x 3 5/8"